I love Paris. Love. I went there for the first time in 2007 with friends and went back again last year with The Pilot. We spent the entire weekend eating macarons and delicious French food, strolling the Seine and getting lost in the gardens at Versailles. It was the perfect vacation. Lately, I've had such an itch to get back to Paris and maybe even take some time to head to the south of France. Visit the French Riviera, see Cannes and Nice...take a ride to Monaco or Marseille. But let's get back to Paris for a minute....I love it. 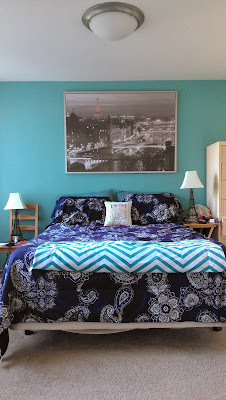 Take a look at my bedroom. Ahhhh Paris. Those lamps? Eiffel Towers. So where am I going with all of this? Well, Go with Oh, my newest favorite website and the place to go to scout out apartment rentals all over Europe, is having a blog competition. 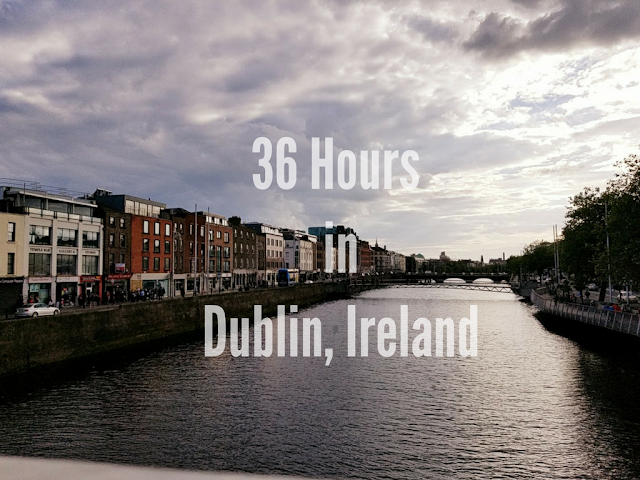 All you have to do is pick your favorite apartment in any one of their 17 European cities and write a post about why it makes you go weak at the knees. 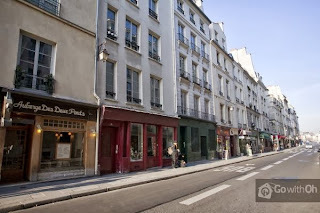 So, after spending countless hours scouting their apartments all over Europe, I kept being drawn back to the Parisian apartments. 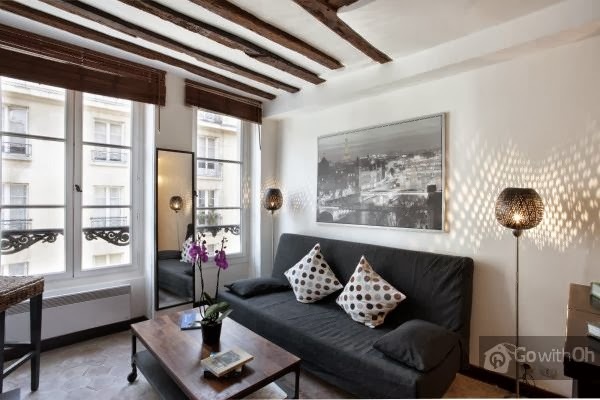 I spent even more hours scouting out the almost 400 Paris apartments before finally settling on one that I absolutely adored. 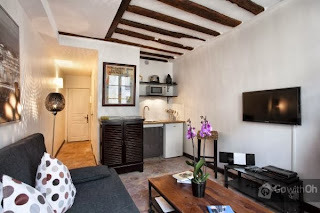 Described as a 'Charming studio ideal for couples in the Ile Saint-Louis area,' this apartment first caught my eye (or, should I say click) because it had the same portrait of Paris as the one I have in my bedroom. The apartment is a small studio on the Ile-Saint Louis, which is just across the bridge from Notre Dame and very close to Pont Marie Metro station, making it very accessible to the rest of Paris. I absolutely adore this studio. The accents on the Juliet balcony, the wooden beams on the ceiling...it's adorable. It's small and doesn't have a full kitchen...but who needs a kitchen when you're in Paris? The last time The Pilot and I were in Paris, we ate all of our meals out and spent almost all of our time exploring the city that we only really went back to the hotel to sleep before heading out again the next morning. The apartment is on a quiet, shop-lined street on Ile-Saint Louis and it just looks like the perfect spot to go for a morning run while The Pilot is still sleeping. 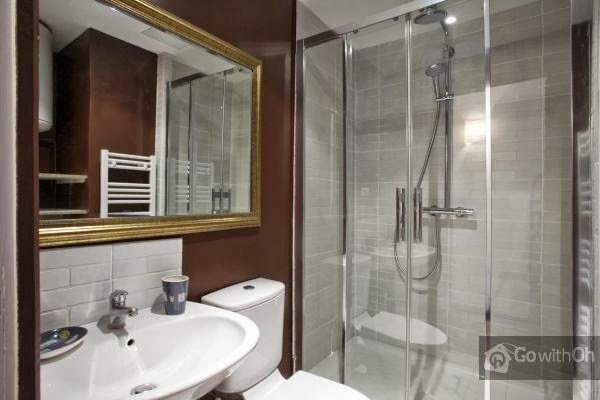 Even the bathroom is perfect. 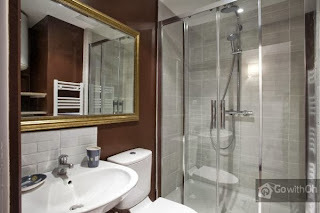 Sleek glass doors with a double shower head? There is nothing better than a long, hot shower after a full day of walking around sight seeing. 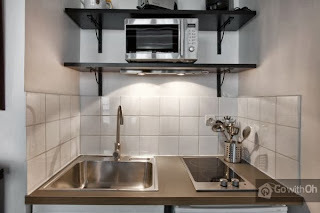 There isn't too much to this quaint little studio, but it's perfect and I love it. Excuse me while I go book two tickets to Paris so that we can jet out tomorrow. 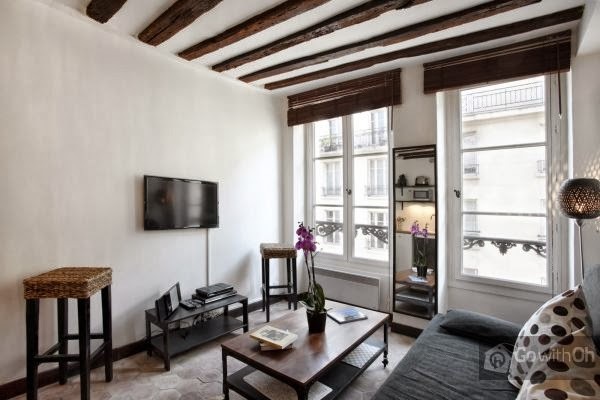 I would love to test out this apartment and peruse the quiet little streets of Ile Saint-Louis. Not to mention that my wardrobe could use a little European refresher. So, Go with Oh, there you have it...this is the apartment that makes my heart skip a beat...and the destination at that! Tell Me: Have you checked out Go with Oh? 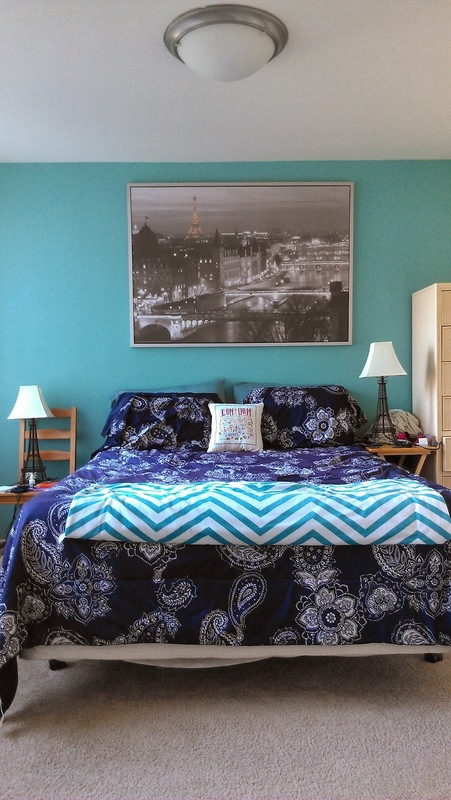 Have you ever stayed in an apartment versus a hotel while traveling? If you could guest test a Go with Oh apartment, which of their 17 cities would you go to? hey, i love the interiors. It must be so interesting for you to travel so many new places. My norm is actually staying in apartments rather than in hotels while traveling. I feel like it gives you a much better feel for a city and more freedom as well. Plus, it's almost always cheaper! I generally use vrbo.com, but I will have to check out Go with Oh. Hope you win! PS - I hope you don't mind, but I stole you Love/Don't Love post format! Love love love Paris. I have that lamp too. Got it at Target. Swoon. Never been to Europe... sigh. Gah-- I'd LOVE to go to Paris! I've never been. This looks amazing!